The bright orange or red berries on the large pyracantha (Pyracantha spp.) make the shrub a magnet for birds and other wildlife in winter, when food is scarce. 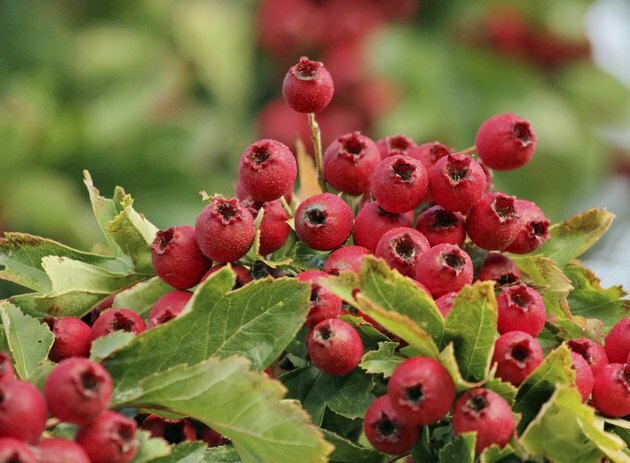 Native to Asia and Europe, the 10 pyracantha species are hardy in U.S. Department of Agriculture plant hardiness zones 5 and 6 through 9, depending on the species. Pyracantha, also known as firethorn, is generally used as a large landscape shrub or hedge due to its size, at up to 18 feet tall and equally wide. Pyracantha berries are a treat to wildlife. Put on shoes, long sleeves, long pants, heavy work gloves and safety glasses before working with or around the pyracantha. The shrubs are heavily armed with 1/2- to 3/4-inch thorns that may cause a reaction in sensitive individuals. Plant the pyracantha in fall or spring. Select a planting site in full sun or part shade, where the soil is well-drained. Pyracanthas are tolerant of most soil types, including clay, but if the soil drains poorly, install large raised beds. Dig a planting hole three times the width of the root ball and at an equal depth. Do not amend the excavated soil. Wrap the shrub in an old blanket or a tarp to protect yourself from the thorns. Remove the grower's pot by slicing it down the side with a utility knife and carefully tip the shrub into the planting hole. Center the pyracantha in the planting hole, spreading the roots gently. Backfill with the excavated soil, then tamp gently. Thoroughly water to settle the soil and eliminate any air pockets. Water the pyracantha with 1 inch of water weekly in summer or during dry spells in winter. Reduce watering during the rainy season. Overwatering can cause root rot. Fertilize with an 8-8-8 or 10-10-10 fertilizer in May. Apply 1 tablespoon of fertilizer for every foot of the shrub's height, carefully scratching the granules 2 to 3 inches into the soil. Water the shrub thoroughly after fertilizing. Prune after the pyracantha finishes blooming, in summer. Pyracantha may be pruned severely to reduce the size of the shrub, or lightly to preserve the flowers and berries. Remove dead, dying or crossing branches with anvil pruners or loppers to allow air circulation through the shrub. Monitor the shrub for signs of fire blight. Fire blight is a bacterial infection that kills the twigs and branches. The only treatment is to prune out the dead and dying branches, cutting back to healthy wood. Place the dead branches in the bin for trash pickup; do not put them on your compost pile. Disinfect pruning tools between cuts with a disinfectant made of equal parts rubbing alcohol and water. Remove pests such as aphids and whiteflies. The groups of tiny green aphids in tender new growth or white whiteflies underneath the leaves are easily removed with a blast of water. Bumpy reddish or brown scale insects may be sprayed with a neem oil solution, mixed at a rate of 2 tablespoons to 1 gallon of water. Soak the undersides of the leaves and twigs with the neem oil solution to kill the insects on contact. Repeat the treatment every seven to 14 days until the infestation subsides.